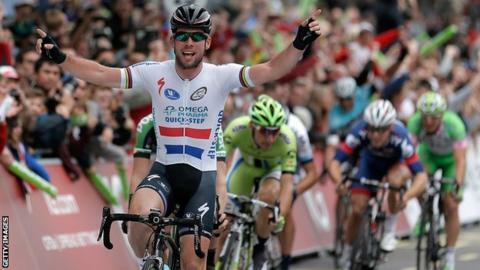 Mark Cavendish won the first stage of the Tour of Turkey with a sprint finish in Alanya. The British rider took victory by more than bike length in the last stretch of the 141km stage. It was Cavendish's first competition since Milan-San Remo in March after being sidelined by a stomach virus. The 28-year-old who rides for was the Omega Pharma Quick Step finished ahead of Italy's Elia Viviani and Holland's Theo Bos. "I was a bit surprised by my speed," the Isle of Man sprinter told his team website after his 25th victory, in three disciplines, for OPQS in 2014. "It's the first race after five weeks so you never really know but I'm super happy that I could come here to Tour of Turkey and win the first stage. Especially after coming back after getting sick." "My team did a brilliant job to keep me up there and keep me out of trouble. I'm glad I could win it for them," added Cavendish who has won 25 stages of the Tour de France.